I’m still waiting on the API (though a draft spec has been posted) so I can have a go at creating lists automagically from hashtag groups (various posts), but in the meantime, here are a couple of little toys that try to spot what’s going on within the context of a particular list. 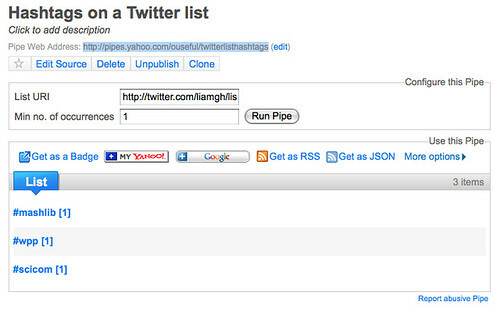 PPS I’d forgotten I’d written this post/already built a pipe to do it, so I ended up creating another one… hashtags used by list participants pipe. 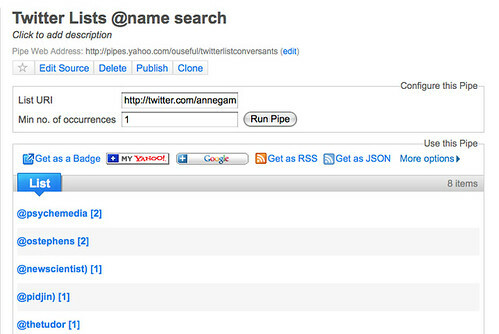 This one does a couple of different things to the pipe mentioned above: it changes all the tags to lower case, thus removing ambiguity in capitalisation; it uses a twitter API parameter to search over the last 250 tweets sent by list members). Pingback: links for 2009-11-02 « Where is my towel?